Unless you have been living under a rock, or a highway underpass in a refrigerator box, for the past couple weeks I’m sure you have read about the new Windows SKU that Microsoft is planning labeled Windows 10 Cloud. It is a resurrection of the old Windows RT in that it is a locked down OS, limited to Microsoft Store downloads only. But unlike Windows RT, theoretically the architecture of the hardware will permit other Windows SKUs to run on the device, provided you come up with the appropriate number of shells to make such purchase. When first reading about Windows 10 Cloud (W10C) I contemplated this thought internally. Then other sites started contemplating the thought in print. Now, it’s being reported that W10C will in fact be upgradable to Windows 10 Pro. Ok, so this makes some sense. An OEM can build a low end PC with a free, or virtually free Windows OS (Microsoft may still want a nominal fee like $9.99 to keep people honest, not sure). And then at a later date, the purchaser can choose to upgrade their PC to a more open version of Windows to allow for downloads of the millions of Windows programs available, along with all the spamware, etc. But wait, what happened to Windows 10 Home? Why would someone purchase a $300 laptop, previously $400, running free Windows 10 Cloud and only have an option to upgrade their machine to Windows 10 Pro for $199, vs. Windows 10 Home, which is all they will ever need, for $99. That lead me to this far out thought. What if Windows 10 Cloud is intended to REPLACE Windows 10 Home? 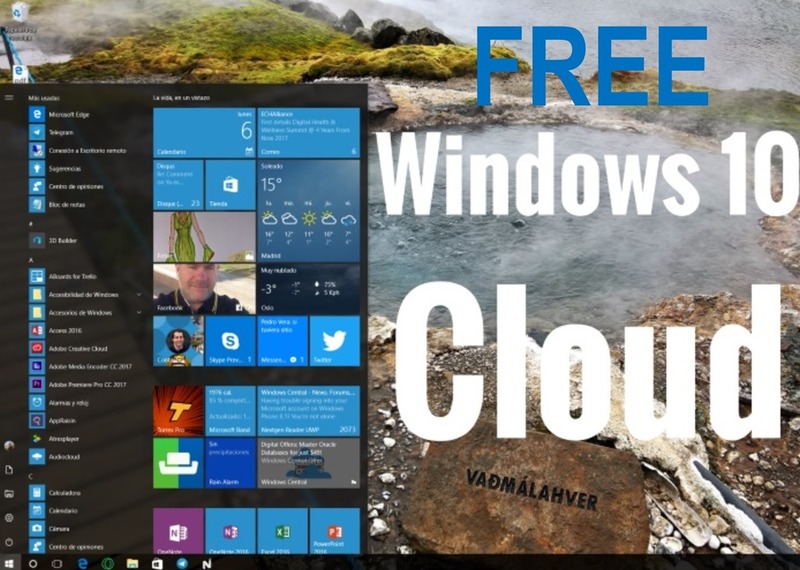 A free version or Windows on every PC valued at around $1,000. That’s pretty much every All-In-One (except Surface Studio), most all tablets and 2 & 1s, most standard non-touch and touch laptops, and almost all desktops. Windows 10 Pro would be preinstalled for higher end laptops and 2 & 1s, like Surface Pro & Surface Book, which is already the case today. Any Windows 10 Cloud machine could be upgraded to Windows 10 Pro, maybe for a new reduced price of around $119. OEMs would no longer get away with selling Android and Windows PC SKUs, with identical specs sans the OS, for $100 or $150 more. Windows could be touted as a free OS, just like Chrome OS and Linux. Parity across all OSs (well, sort of). At least that would be the talking point. Yes, Microsoft would lose income by losing licensing of Windows 10 Home. But they have been acknowledging for some time that the Windows OS is a losing profit center, especially in the consumer sector. This would just be part of the natural evolution of Windows, free Windows. Rely on other business units to make profits while keeping the Windows OS relevant. Truth be told, anecdotally most Windows 10 users I encounter, and even earlier versions of Windows, have never intentionally installed a program on their computer. Sure, I will find AVG Toobar, and SpyWare Remover, and a collection of other spamware that only slows a machine down. But actual purchased, or even free, software. Nada. I will typically install Adobe Reader just to be helpful, but there are plenty of alternatives to that EXE file. So, generally speaking, most users won’t even know that their lower priced PC can’t download an EXE file until they encounter a website trying to install something they don’t need. But they also won’t be installing malicious software and other things that can infect and damage their PC. The bad guys would be left with OS X. How sad. And how will Goggle react to something like a free, locked down Windows. Well, they may finally be forced to acknowledge the Windows Store’s existence and develop apps / paths to download some of their tools. Nothing wrong with that. Of course, I have previously acknowledged how pitiful and hidden the Windows Store is currently. So it would take some kind of miracle for Microsoft to get developers to start working to build out the available titles. But the thought of hundreds of millions of opportunities, a captive audience, may just be enough. Not sure. This could all happen as soon as the Creator’s Update this spring, or Microsoft could try easing into it, which would simply prolong the confusion. As of April, OEMs can start shipping devices with W10Cloud. Everyone who upgrades to the Creators Update will be upgraded to Win10Pro at no cost to them. The Win10Home SKU would be discontinued. PCs already on shelves would get the Creators Update, along with Win10Pro, when they setup their new machines. But new SKUs would be priced lower, with no Windows licensing fee, and labeled Windows 10 Cloud installed. it will be interesting to see how this all plays out. Stay tuned. Previous articleWait, Microsoft has an App Store? Really!